No watch dominates a company's history like the Vulcain Cricket. Vulcain began as a family business in 1858 with Jacque Ditisheim and his sons Maurice, Gaspard, and Aron. By 1889 the family were awarded a Bronze medal at the Paris World's Fair for their No. 2259 grand complication pocket watch which rivaled any made by Patek Philippe or Vacheron Constantin; it had a grand sonnerie, full hour, quarter-hour and minute repeater and a perpetual calendar with moonphase. The case was finished in enamel, a gentleman reading to two ladies on one side and a landscape of the Arve Valley on the other. In 1891 Maurice died and his twenty year old son Ernest-Albert was suddenly in control of the family business who started the branding transition from Ditisheim to Vulcain, the French name for the Roman God of Fire and Volcanoes. Soon world events conspired to erupt; Germany began to re-arm in the 1930's and claim territory, the Ditisheim family were concerned about invasion and occupation. When Jacque Ditisheim first moved to La Chaux-de-Fonds he was subjected to petty antisemitism, the locals fearing the Jewish merchant would steal their business so he had to live outside city limits. A German occupied Switzerland would be all too willing to make an example of a wealthy Jewish family so drastic measures had to be taken. Finding an employee with the most Swiss sounding name, Louis Vuille, the Ditisheim's transferred all their shares and placed the business solely under his name. It was a risky decision as Monsieur Vuille was under no obligation to return the shares when the war ended, not to mention the severe repercussions he would have faced if the ruse had been found out. Thankfully on news of the German surrender in 1945, Vuille returned every share to the founders without a word. Vulcain's desire for achievement was not slowed by war and Robert Ditisheim had begun development of an alarm wristwatch in the early 1940s. Alarm clocks were common but the difficulty of creating a wristwatch with an alarm complication had eluded every manufacture. The problem of miniaturizing the striking movement to fit inside a watch case only compounded the problem of making the alarm function precise and loud enough to be of any use. Two alarm watches created in 1910 and 1920 were failures as they were inaccurate, quiet, and the vibrations would ruin the adjustments made to the balance. Robert Ditisheim was not deterred by the failure of others, in fact it propelled him to work even harder. A scientist friend encouraged him by saying that if an insect as minuscule as a cricket could make such a loud noise then surely a complex man-made mechanism could do the job just as well. The first prototype was made in 1942 but it took another five years to perfect the technology. The 22mm manually wound Caliber 120 was the result of their hard work. The 120 had two separate barrels to store energy, one for the movement and the other for the alarm function. By turning the crown clockwise the movement barrel was wound and anticlockwise wound the alarm barrel. This extra barrel meant that the alarm would not draw power away from the movement and could ring for a full 25 seconds if fully wound. The sacrifice for this convenience was that the hands of the watch could only be set forwards. Pulling the crown out completely and then counter intuitively rotating it anticlockwise allowed the hands to be set. By fully depressing the pusher and then rotating the crown clockwise you are able to set the alarm, which is only set backwards. When the alarm rings you simply depress the pusher halfway to silence it. The Caliber 120's architecture is surprisingly modern for a piece created in 1947. It lacks any of the familiar Cotes de Geneve decoration and is dominated by the oblong base plate, large screws and the hammer at three o'clock. Vulcain solved the problem of volume by having the hammer strike a membrane and pin that was directly connected to the caseback. The sound resonating from the watch was then amplified by a second exterior caseback, small sound holes similar to those on a cello allowed the sound to escape. The Cricket was shown to the press at the New York Waldorf Astoria and was touted as one of the biggest achievements in watchmaking. A combination of innovation, public excitement and some fantastic advertisements made it an instant success. "The Cricket establishes your reputation as a man of supreme punctuality and infallible memory"
Over a decade later the Vulcain Cricket "Golden Voice" was released, a smaller alarm watch aimed at the female market. The new Caliber 406, a 19.5mm movement, used a gold membrane which had been chosen for its superior resistance to corrosion and the soft resonance it produced when struck. Eventually a new men's Caliber, the 401, was released which had a date window and subsidiary seconds at six o'clock. There was no room for a second barrel so the alarm length was decreased to 15 seconds and sales of these new Crickets suffered for it. The Vulcain Cricket would have remained a popular watch for its time if not for a chance event that solidified its fame and place in history. President Truman certainly has a strong history with wristwatches. During his time as a Senator he lobbied congress to fund the Gallet Flight Officer for USAAF personnel (a watch that he would be seen frequently wearing) and he also wore a Universal Geneve Tri-Compax whilst signing the Potsdam agreement. When he left office in 1953, the White House News Photographers gifted him a solid 14kt gold Vulcain Cricket with the engraving " One More Please" on the case back, a phrase often asked to the President whilst posing for photographs. This would mark the beginning of the tradition for Presidents of the United States to receive a Vulcain Cricket. 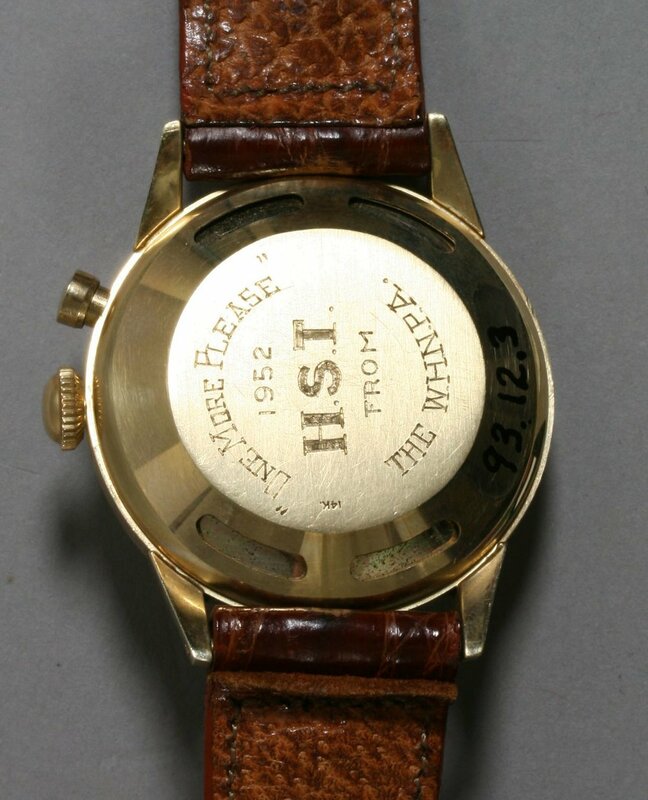 Whilst Truman's successor, Dwight Eisenhower, is more commonly associated with his Rolex President Day-Date, he too wore a Vulcain Cricket frequently. It is unknown how Eisenhower got the watch and where it is now. A potentially apocryphal story says that during a press conference on the raising of tariffs on Swiss watches the President was interrupted by the familiar chirping of his Cricket much to the amusement of the Press. President Dwight Eisenhower wearing his vulcain cricket. In 1955, Vice-President Richard Nixon was gifted a Vulcain Cricket and an Ingraham mantle clock by the National Association of Watch and Clock Collectors after addressing their 11th annual meeting. In 1960 he sent the watch back to Vulcain for service and spoke very highly of it. Vice-President Richard Nixon receiving his vulcain cricket from the NAWCC. Photo courtesy of the NWAC museum. Lyndon Baines Johnson was the only President to have bought his Vulcain Cricket in Geneva and perhaps out of all the Presidents he loved his Vulcain the most. His personal Cricket is unique in that his signature appears on the dial at nine o'clock and whilst attending a United Nations meeting in Geneva, he ordered 200 Crickets in bulk which he then gave away as gifts over the course of his term. I've seen stories that the Secret Service detail absolutely loathed President Johnson's Cricket as the constant whirring and chirping sounded all too much like a bomb and that Johnson would deliberately set the watch to strike halfway through meetings so he could leave early. The tradition of Presidents and Vulcain Crickets subsided for several decades until a Finnish Jeweller, Keijo Paajanen, and his father decided to rekindle it. As stockists of Vulcain watches they met with Michael Ditisheim, son of Cricket creator Robert, and proposed gifting watches to Presidents who visited Finland. In 1988 Ronald Reagan became the first President in nearly twenty years to be given a Vulcain Cricket. In 1990 H. W. Bush was presented (along with his Russian counterpart Mikhail Gorbachev) with a Cricket during the Helsinki Summit and five years later President Ford visited Iceland for the 20th anniversary of the Helsinki accords and so received his own alarm watch then. The vulcain Cricket can be seen on the wrist of gorbachev on the cover of time. Both Presidents Clinton and Carter received a Cricket in 1997 when they visited Finland and President Obama was sent his shortly after his first inauguration. President JFK's life was cut short before he was given the watch and as of yet President W. Bush has not visited Finland so has not been gifted one by Keijo. In five months we will know who the next recipient of a Vulcain cricket will be. The ownership of Vulcain changed hands during the mid-Sixties and was revived in the early 2000s. Unsurprisingly Vulcain now leans heavily on the Cricket's lineage with three alarm families in their collection: the 50's Presidents range, the Anniversary Heart, and the Cricket X-TREME. The design of the 50's Presidents is reminiscent of the late fifties early sixties design of the cricket with a more simple and elegant dial with dauphine hands and long thin batons. The Anniversary Heart is the watch President Obama received and the Cricket X-TREME is.....well I'm sure it's someone's cup of tea. The Vulcain Cricket is a watch that will forever be linked to the tenants of 1600 Pennsylvania Avenue. Despite its Presidential lineage, vintage Crickets are able to be found for well under $1000 and are one of the best value complicated watches currently available. One can currently be found in pristine condition over at 10:25 Vintage. I'd like to thank the National Watch and Clock Museum, the L.B.J Presidential Library and the J.F.K Presidential Library for their aid in researching this article.